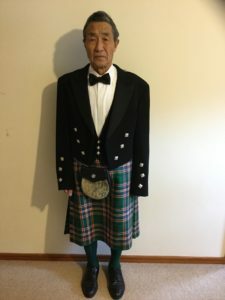 My Children’s Chinese Great Grandfather | WWAM Bam! 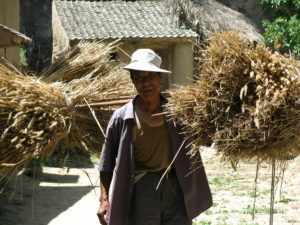 My husband comes from a terraced mountain hamlet in Gansu province. He was brought up by his grandparents who still live in the same room made of earth and hay (the kitchen and spare room were recently buried in a landslide). There is no running water or landline phone connections. Some villagers have never seen outside of the nearest town. I first realised that many of the villagers in Gansu were yet to venture out of their terraced mountains during my first lesson as a volunteer English teacher when I was 18. Students from other classes had snuck out of their own lessons, their faces squashed up against the windows that separated the classroom from the corridor. Heads behind the sardine faces occasionally appeared into view as others jumped up and down from behind. I showed some photos of Britain to my class and drew a map on the chipped blackboard. To me, I just saw a sea of black hair, all the students looking as if they could be siblings or twins even. The boys wore baggy suits and the girls similar but more colourful. A pair of boys in the middle were sharing a pair of glasses and another boy at the back of the class was trying to position two pairs of glasses back to front in order to catch a better view. “Any questions?” I asked as I put my photos from home away. I took out some postcards I’d bought on the Great Wall during orientation. Surprisingly, they were more interested in these pictures than the photos I’d brought from home. Naively I assumed that the Great Wall was so long you just can’t miss it. I thought all Chinese people had walked along it. “Who has been to the Great Wall?” I asked as the excitement over photos of the Great Wall escalated. The back rows of students were leaning forward enough to make their desk fall onto the people in front. No one had been to the Great Wall before and without internet access, images weren’t readily available. I had no idea my husband-to-be was in the classroom next door. Okay, so I was his teacher but due to family circumstances he started school late and was actually a year older than me. In his hamlet, many have never set foot outside of the village; seen a train; or even been on holiday. Initially I found this hard to understand but at the same time it was an opportunity to have a bit of fun. I decided to make sure that those who helped my husband when he was younger were paid back with memories or helped to achieve a goal. You see, my husband’s family was really very poor and the majority of the villagers distanced themselves from his family. His father was also a wife and child beater. So cruel it breaks my heart. To repay the kindness he did receive, I have so far: helped arrange a life saving operation for a child, put someone in college, and my biggest project took eight years and thousands of hours to complete. I’ll save that for another post as its a story in itself. Sometimes I have felt drained. Almost like I was a bird that lent my wings to help another fly. I must now focus on our own growing family, but there is one project that still makes me smile. For the grandparents who brought up my husband, I have well and truly silenced those in the village that used to say, “why take care of him when he’ll forget about you when you’re older”. A couple of years after that first lesson in his school, I was studying at university in Beijing. 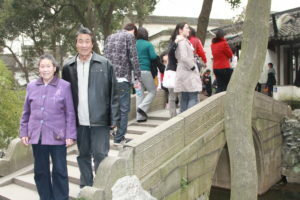 Like my students above, my maternal grandparents-in-law had never visited the Great Wall. There were so many firsts left to experience. They were in their seventies, so I thought that if we waited until we were financially stable it could be too late. As I was renting a flat in Beijing, the accommodation wouldn’t cost anything, just space. And food? Just two extra pairs of chopsticks as the Chinese like to say. The box ticking project began. First there was the obstacle of the uncles…even though the grandparents lived alone, the uncles were not happy about me taking their parents outside of the village. However, the invite from me in Beijing was too exciting and grandfather made an executive decision. They stayed with us for 6 months in our two bed flat. Grandfather didn’t become unwell as the uncles feared. Actually he caught a very serious travel bug. He was like a child in Disneyland and he didn’t want this to be his last trip. 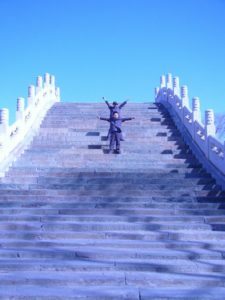 The Great Wall, the Summer Palace, the Forbidden City, McDonalds, pizza, Korean barbecues, and all the Chinese New Year fireworks (before they were banned). The next year they stayed in their mountain village but I had enjoyed their visit so much that I kidnapped my husband’s aunt and two young cousins. 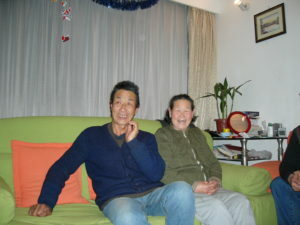 Their dad had sent them to their provincial capital Lanzhou for the weekend to visit my sister-in-law. I persuaded her to buy them train tickets to Beijing. 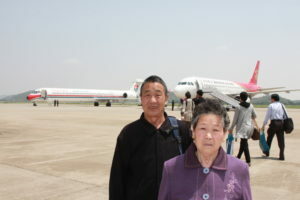 After arriving in Beijing we called their father back in Gansu. He didn’t believe me and had to call us back on the landline. They stayed all New Year. 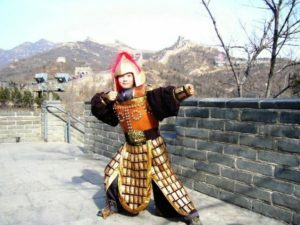 They dressed up as soldiers on the great wall and I even dressed them up as girls as their mother had always wanted one. Makeup, wigs, the lot. One looked particularly beautiful. Sorry, they’d kill me if I shared those photos, so I’ll leave them in their mother’s private album. A couple of years later we had moved with our first baby to Suzhou and the now great grandparents spent another Chinese New Year with us. 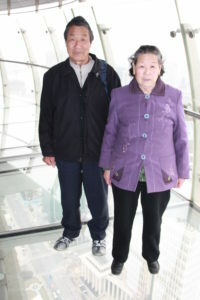 They visited the beautiful gardens (these are free for the elderly with proof of ID), water villages, went on roller coasters, a ferris wheel, and my husband took them on their first plane flight to see the sea. 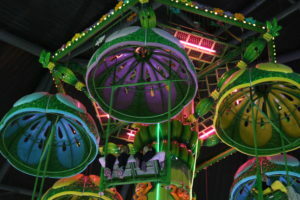 Unfortunately the amusement park in Shanghai had an age restriction. Grandfather was highly disappointed. 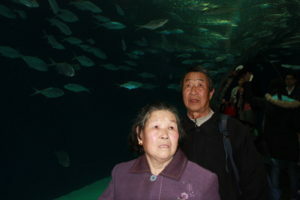 Although standing on the clear glass high up on the Pearl Tower in Shanghai and visiting the aquarium made up for it a little bit. Several years later poor grandfather-in-law’s travel bug was peaking but we were now living in the UK. We decided to invite him over. This time without grandmother as she is now not well enough to leave the village. He was so excited, the following morning he climbed down the mountain to catch the first mini bus to the nearest town to apply for his first passport. He then travelled by himself down to Hangzhou to apply for his visa. He paid for his own flight (at least half of his yearly income from the orchard). Having arranged for my mother-in-law to look after grandmother and his apple orchard, we all waited anxiously to see if he could make the three transfer flights! I made the following video of his trip. I hope you enjoy it as much as we enjoyed helping him tick off more boxes. What an inspiring story, Felicity! Thanks for sharing it. Really important message…..it’s never too late to get started! Thank you Heather:) It really is never too late. 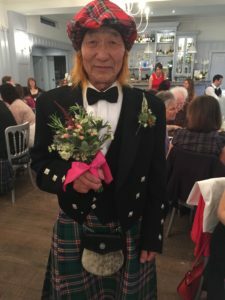 I once met a retired couple in the UK who started a 4 year degree in Chinese, including a year abroad in Taiwan. They had to delay the Taiwan trip for a hip replacement but they studied hard along side the 18 year olds. I don’t know how they got on but even to give it a try at that age is amazing. What a beautiful story!! My heart was warmed so much by reading it! I also was surprised, when talking to my co-worker, that he had grown up in a village that did not have electricity until he was six years old. It is my own ignorance showing…but when so many of my Chinese co-workers have attended big universities or are from the city, I started assuming that their lives/experiences are, in general, what growing up in China is like. I wasn’t aware of the villages, such as the one your husband is from, or the one that my co-worker is from. It shows there is quite the range of economies and experiences within China. Pingback: WWAM of the Month: Felicity Miller | WWAM Bam!